Emma Lawton, 33, author of Parkinson’s memoir ‘Dropping the P Bomb’ and David Sangster, 35, founder of the ‘1in20Parkinsons’ online support collective, were both diagnosed with young-onset Parkinson’s disease at the age of 29. To coincide with the UK’s Parkinson’s Awareness Week, 10–16 April, they have challenged themselves to each create short videos capturing their lives with the condition – every day for a year. 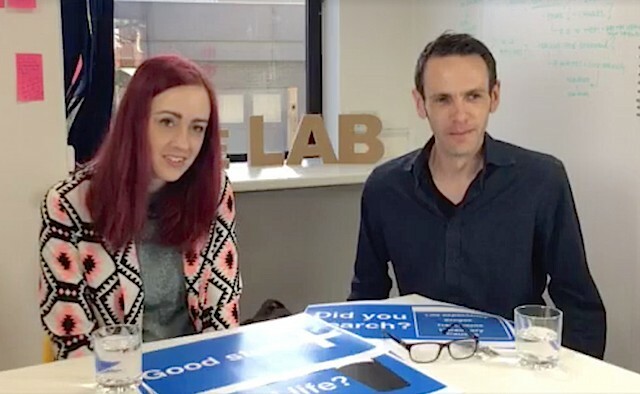 Emma – who featured on the BBC Two television programme, ‘The Big Life Fix with Simon Reeve’, where an engineer created a tremor-reducing watch for her – came up with the idea and she approached David to join her in the project. To make sure they can fit the demands of the challenge into their busy lives each day, the pair have set some ground rules – each videos will be no longer than five minutes, take a maximum of 30 minutes to upload and will portray the condition as honestly as possible. Emma’s first video shows her wide-awake at 02:34. As she’s tremor-free she decides to put on her signature eyeliner right there and then. By 05:37 she properly begins to get ready for the day, and she is due at a radio studio later that morning to speak about her condition. Emma responds candidly: “Yes, I mean, no-one was expecting it, least of all me. But I was very lucky to have a great GP – who put me forward to a great consultant – and my Parkinson’s was was picked up very quickly. But I know that’s not the case for a lot of other people. The quick diagnosis it meant that I was able to start medication very quickly, which was something I was quite excited about. Watch ‘Day 1 of PD365’ from Emma Lawton below. “I was in a taxi traveling through central London and I heard Jordan Webb [a student diagnosed with Parkinson’s at 17, now studying for a Master’s degree in neurorehabilitation of movement disorders and traumatic brain injury] talking about his condition on the BBC Radio 1 show, ‘Newsbeat’ – which is a really good place to let younger people know about all kinds of issues,” he continues. Watch ‘VLOG_001 #PD365’ from David Sangster below.